Traditional textiles are often associated as cultural objects since much of the thoughts about the work, materials and techniques have significance in meaning and value. For centuries, the practice of producing traditional cloths in Indonesia has been passed down from generation to generation. Although the method is seen impractical, the symbolic meaning and value embedded in its creation are still relevant to be passed on to today’s generation. For many, it becomes a profound association of the root of their identities. “Indonesian Traditional Textiles: A Diversity of Expressions” reflects the significance of diversity rooted from the Southeast Asia region. This event is selected as one of the signature events in the 2014 Asian Heritage Month Festival. The exhibition showcases Canadian collections from local communities. Textiles from island communities in Indonesia such as Sumatra, Java, Bali, Sumbawa, Nusa Tenggara, Maluku, Sulawesi, and Kalimantan will be on display with captions from Indonesia’s prominent curator, Judith Knight-Achjadi. A resourceful textile anthropologist, Judith Knight-Achjadi is well respected among the Southeast Asian traditional textile communities. She is appointed as Honorary Curator of Jakarta Textile Museum, an author/editor of various Indonesia’s textile literatures, and the main contributor for the paper that leads to UNESCO’s recognition of batik as Indonesia’s tangible cultural heritage. To complement this exhibition, a team from Indonesia will present and demonstrate the creation of batik patterns using fractal formula on jBatik Software, which will be followed with traditional textile making process. The success of this project is derived from a lengthy research in which relationship of batik and fractal formula were explored. As a result, the team invented a new measurement tools for batiking and has successfully presented their findings at the 10th Generative Art International Conference in Italy. The paper is selected as part of the Conference Proceeding in 2007. We are confident that the local communities will benefit greatly from their participation. Vancouver Asian Heritage Month Society (VAHMS) As the organizer of Asian Heritage Month, VAHMS continue to develop a broad and inclusive definition of “Asian” in Canada and create an environment of synergy, collaboration and integration across the Pan-Asian communities with a special program emphasis on integration into the mainstream of Canadian society, our dual Asian and Canadian identity and hybridity – current issues of importance in our multicultural society. Consulate General of the Republic of Indonesia in Vancouver, BC. To develop better interactions in social culture area is one of the mission of the Indonesian Consulate. Their support in this event signifies the delivery of our programming and enhance the appreciation of Indonesia’s culture. Vancouver Public Library – Central Branch. 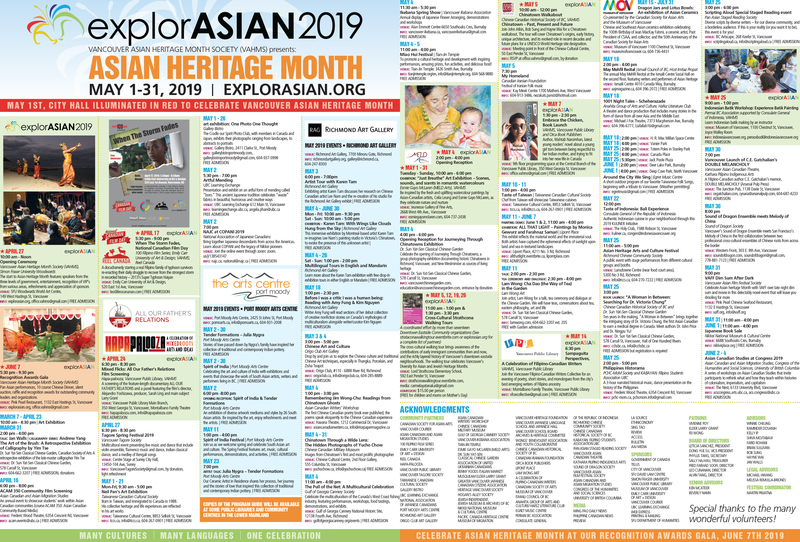 As part of their commitment to support the local communities, Vancouver Public Library has agreed to co-sponsor this signature event to celebrate the 2014 Asian Heritage Month Festival.